Are you in need of the best wedding budget template? 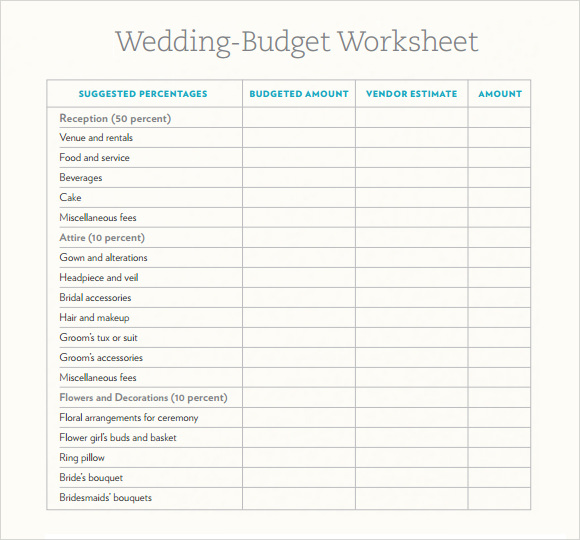 Whether you are planning a budget for your own wedding or that for a friend, the template will really make the work easier for you. Instead of struggling on your PC creating these from the ground up, simply Google for free templates, and download one or a couple for use in wedding budget planning.The printable templates can Be reused in the future should another wedding Plannings arise in the same community.Be customize for personal taste and preference.Be printed the Sample Lists and share among the members of the wedding committee.Be used for reference during wedding planning. You can also see Budget Templates. Weddings are the most beautiful but hectic events of a person’s life. 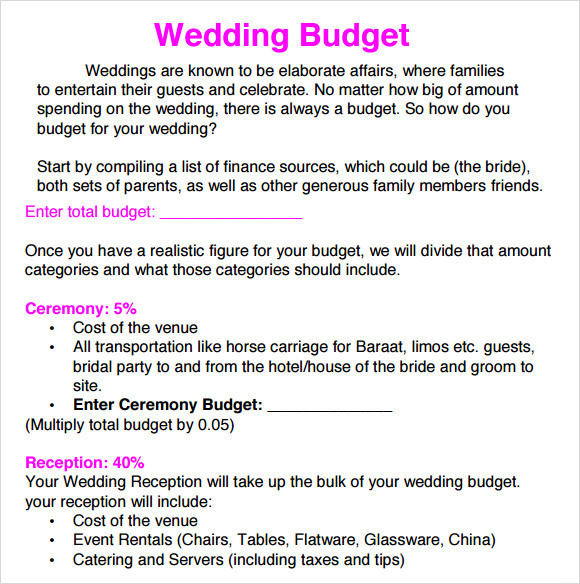 The hectic event can be managed using this wedding budget worksheet template. The template can be easily downloaded by you if you need a pre-prepared proforma for making a wedding budget. This free template is also available in PDF Format. 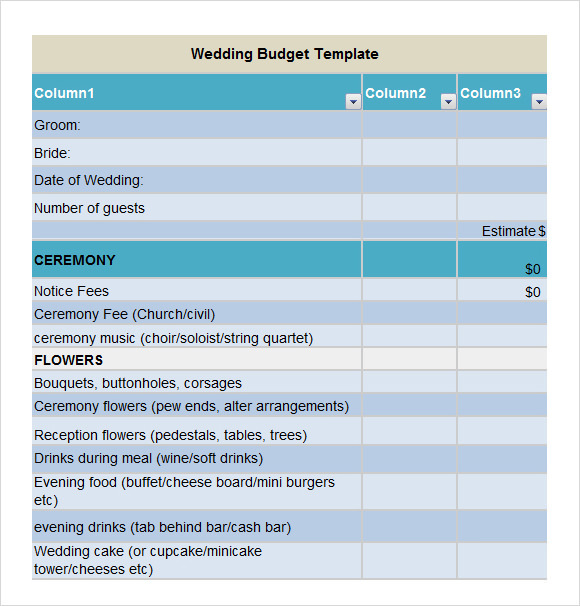 A wedding budget spread sheet template is an intricately designed template doc that can be used by wedding planners as well as bride & groom when they are preparing a wedding budget for the wedding. In a format of spread sheet, this document contains mainly three columns which are- name of the item, estimated budget for the item and the actual expenditure on that item. This template is available for free downloads. 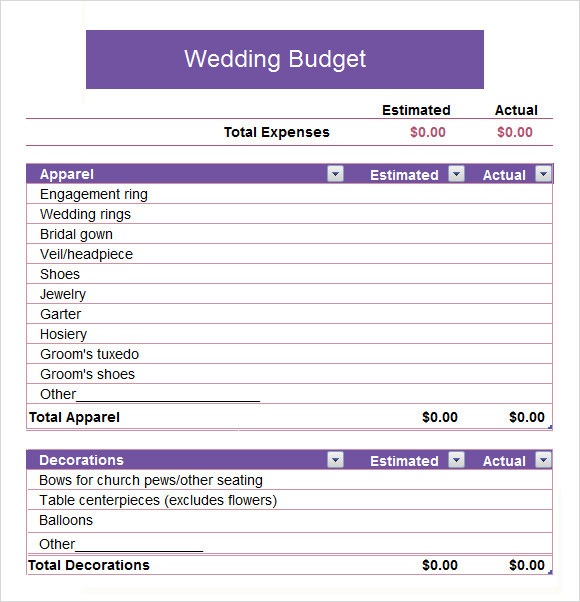 This wedding budget template is an excel format sheet that can be used as it is for recording wedding budgets. This template has various sections that are part of wedding affair i.e. Apparel, Reception, Beverages, Food, etc. So the section wise distinction is helpful for the planners since they can refer to it for future use. Download this template online for free use in various formats like PDF, Word, Sheet, etc. 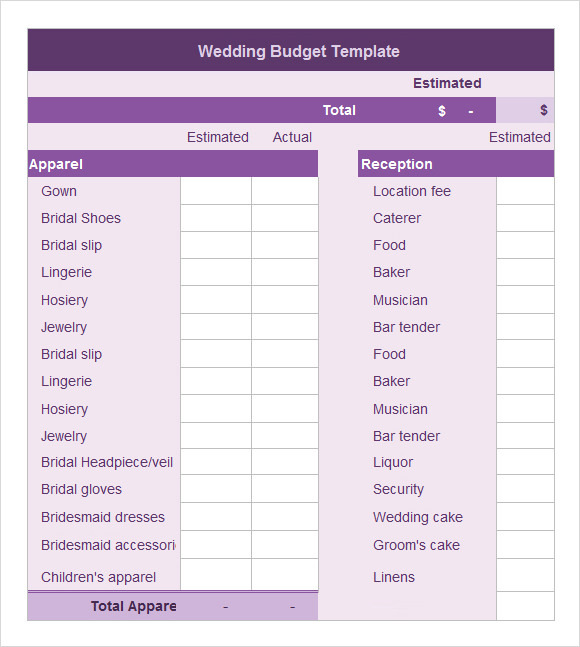 A wedding budget worksheet excel template is a well-sought document that many of the to-be-weds use for planning their wedding. This popular template is a perfect choice utility-wise since it is comprehensive list. The document contains all the necessary items that are part of a wedding as well as the miscellaneous items that are often ignored. Download this free template online just by registering your e-mail. 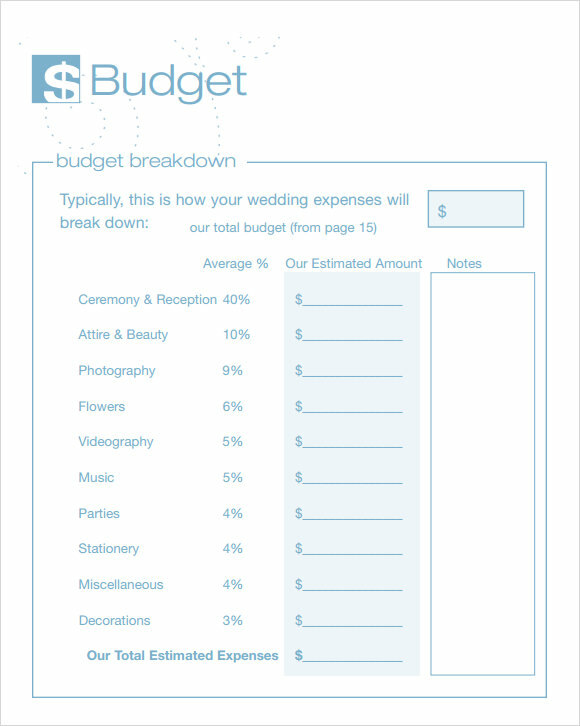 Why do we Need a Sample Wedding Budget Template? The sample wedding budget templates are a list of self-sufficient, utility-friendly, elaborately made templates that can be harnessed by to-be-weds to help them make a sleek and neat budget for their wedding. They are a preferred choice these days because we all know that weddings are a crazy affair that requires meticulous planning and lots of hard work. This means that the templates will surely reduce the burden for the newly-weds. The budget templates thus are a wise choice.You can also see Grant Budget Templates. When do we Need a Sample Wedding Budget Template? The sample wedding budget templates are a ready-made solution for the newly-weds who are planning their weddings. Budget allocation is indeed important so that all the things they plan are included in the proforma and no important thing is missed from the budget. These templates are thus beneficial. Most of the templates include columns like apparel, food, reception, etc. wherein the planner can add the estimates for each department separately. This helps in avoiding any overlaps. Thus the preference and likeability for sample wedding budget templates. What are Benefits of Sample Wedding Budget Templates? These templates are interesting, helpful, and creative, thus it guarantees a good experience. The quality of these templates is ensured by the makers. That is why both the wedding planners as well as to-be-weds favour a wedding budget template. This is because it reduces burden and helps erase any overlaps. Since all the items are listed in it with separate heads. This template is thus a benefits loaded choice. The need of wedding templates is immense and the price of these templates is negligible, thus people switch to these beneficial templates. Also, the templates help in avoiding any monetary overlaps, thus the need of these wedding templates. Also the templates are available in formats like PDF, Word, etc. thus it’s an additional benefit.You can also see Cash Budget Templates.